The following necklaces are examples of the finest millefiori beads, referred to as "fine" millefiori. The millefiori bead is made by first melting, or lampworking, Murano glass onto the copper wire. 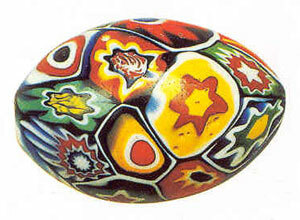 Once the initial bead is formed, the artisan holds the bead in the flame and with tweezers, picks up small millefiori slices (also called murrinas), previously cut from millefiori canes, and places them directly on the heated center bead, covering the bead without leaving any space between each murrina. The Murano artisan then smooths and polishes the bead, obtaining the finest and highest quality beads that are envied by other bead makers. The complete making of these perfectly shiny beads is a secret, like many others of the workshops on the Murano island, and it is jealously guarded in the family tradition.